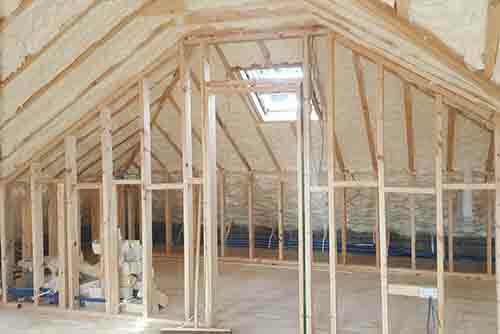 CPI Foam Ltd. provides spray foam insulation products and training to relevant contractors in the construction industry in Ireland. 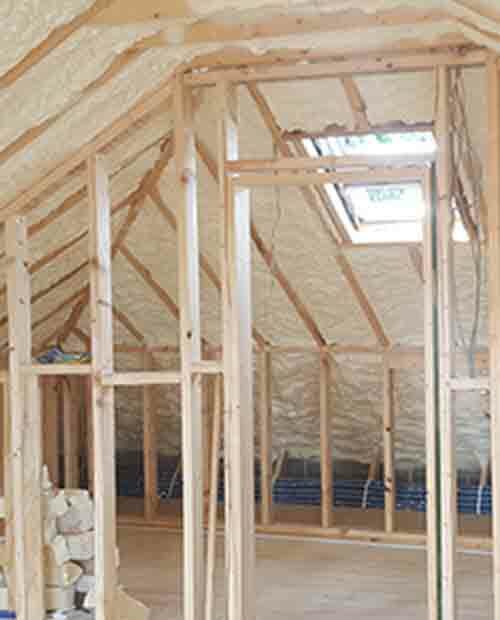 The main product they distribute is Ezero spray foam which has a range of benefits as well as practical advantages over other insulation types. The company has recently received NSAI certification, which is the highest accolade possible for open cell spray foam by the NSAI agreement board in Ireland. 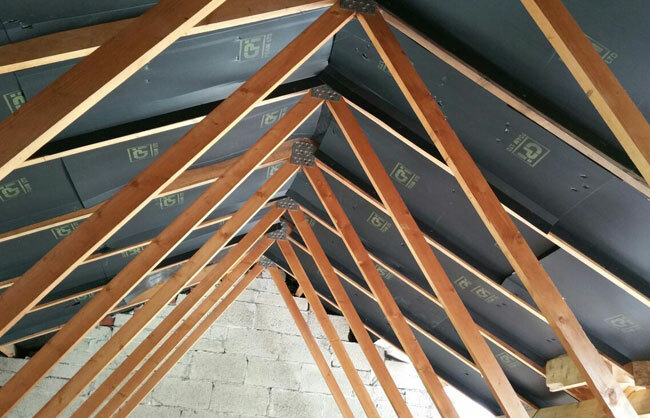 The product E: ZERO/E: 500 had to undertake stringent tests under Irish conditions to establish that it was suitable for its intended use as “a proper material” to comply with the latest 2010 building regulations. 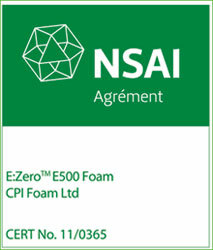 In doing so E: ZERO/E: 500 is the only spray foam currently certified to this set of Building Regulations. This has reinforced the company’s belief in the product and since achieving the certification the product demand has been increasing across a range of interesting markets. The spray foam product has inherent attributes over existing insulation products and applications on the Irish market. These particular strengths have allowed the product to be applied to a range of new applications which has opened new markets. The company recently completed an application of the spray foam to a typical Irish poultry shed. They have since received very positive feedback from the client. The project proposal will look at the potential within the poultry industry for this insulation. Increasing pressure is currently being applied to the agriculture sector from both EU regulations and Supermarkets to reduce carbon emissions. This coupled along the potential for cost savings could mean a significant new market for the use of spray foam insulation being applied retrospectively to existing poultry sheds. This project will also evaluate an actual application of this insulation which was retrofitted to an existing poultry house with a cost saving analysis as well as looking at the other possible advantages and disadvantages. Chicks are typically delivered to the farm at a day old and are taken away for slaughter at between 33 and 42 days old. The Irish poultry sector is and has been facing economic challenges because of energy and inputs costs coupled with an influx of foreign imports. The retail sales are valued at approx. €235 million per year. The output at producer level is valued at approx. €160 million while, poultry exports including value added products, amounted to €183 million at factory/manufactures level most of which (82%) is exported to Britain. Ireland is currently on the other hand importing 74,000 tonnes from 44 markets at an approximate cost of €250 million. It is also worth pointing out that the above figures are only based on the Republic of Ireland only. In Northern Ireland the poultry industry also represents a significant sector and again predominantly located in the border region. The Poultry sector, like other farming sectors, is an energy-intensive operation that has been put under pressure by increasing costs. Lighting, heating, ventilation and air circulation equipment are exerting the biggest energy demands. These are the areas that offer the most potential for savings. Improving farm energy performance should also result in an improved environment for the poultry, with potential production efficiency gains through improved bird growth. Energy efficiency is the first step you take to reduce your energy bills. Typically just like the domestic house situation an energy audit on a poultry unit will identify savings that can be made by doing things differently. Once these savings have been made then the renewable energy options can be considered. In addition to economic benefits, there are social and environmental advantages to reducing energy consumption, such as preserving fossil fuel supply and minimising the impact of climate change. With many produce buyers now demanding that farmers and growers demonstrate their green credentials, being energy efficient can only serve to enhance your business. Focusing on low and no-cost measures and actions which will provide a quick payback, any cut in energy costs ultimately results in the same bottom line benefit as an increase in sales. Controlling energy usage also has a beneficial effect on produce. The typical poultry units in Ireland are constructed using a concrete base with either a timber of steel frame portal structure, stud walls and built-up roof. Over the last 10 years there has been significant improvement and development of new poultry houses. However this project report aims to look at the benefits of retrofitted spray foam insulation in the older stock of these poultry houses. The application of this insulation and its performance will be researched along with possible improvements to groundwork and foundation systems to improve thermal resistance. The benefits and the cost implications of spray foam insulation will be compared with those before in the installation of the Insulation along with other possible options to improve the energy efficiency of poultry farming. 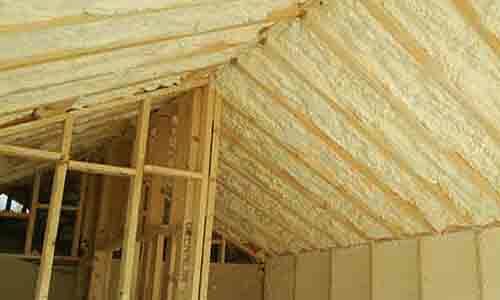 Research the application methods and properties of spray foam insulation. 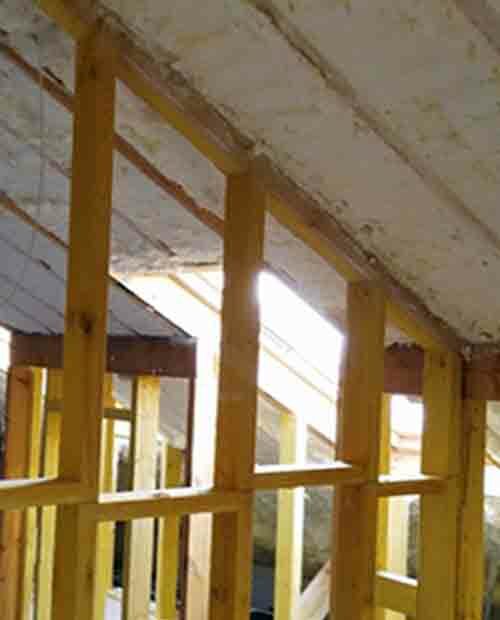 Analysis of an existing retrofitted application of spray foam insulation comparing the costs in relation to the benefits of using spray foam insulation, against the energy cost before the installation on Mr David Scott’s farm in Newbliss County Monaghan. Analysis of the potential market for this new form of Insulation. Provide information on other improvements which could be made to a typical poultry house to improve the energy efficiency. The typical Poultry Sheds currently use a timber structure mounted on a concrete plinth and clad in timber on the walls and corrugated sheet metal on the roof. The thermal performance and energy use of poultry shed buildings is important as this has a direct influence on the health and cost of maintaining a healthy flock. The need to manage the internal temperature and ventilation of poultry sheds results in high energy costs for poultry producers. The demand for energy varies with the time of day and season as well as the stages in life cycle of the flock. The health and performance of the flock will suffer if the conditions within the shed are not properly managed. It may be possible to reduce both the overall energy demand and the variation in energy demanded for heat by designing a more thermally stable shed. In simple terms, insulation of the structure, walls, roof and floor, can help any building in maintaining a more constant temperature and reserving the heat within the building, therefore requiring less energy for temperature control. Understanding the thermal performance of the building fabric is vital if energy demands are to be reduced. Each element of the building, roof, walls and floor, has the potential for losing heat. 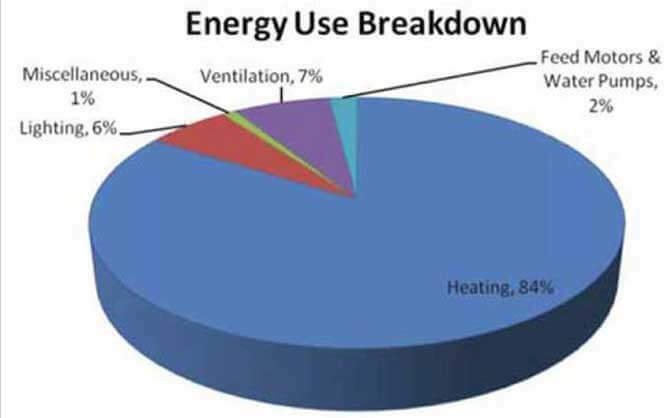 Of the overall heat lost from a building the average percentages from each element are as shown in Figure 3 Heat Loss Diagram. To improve the overall thermal performance of the building design, each of these building elements need to be considered. This is undertaken by analysing each building component in relation to the specified materials, their thermal insulation qualities and specified thicknesses. Spray foam Insulation is particularly suited when applied to older poultry houses as the foam will create a continuous 50mm layer of insulation thus reducing the energy needed for heating and ventilation with the improved thermal performance of the wall and roof. Production performance improves as more uniform temperature is achieved. Figure 4: Sectional Diagram showing the continuity of the spray foam insulation Avoiding air leaks is important in the control of heating costs, especially in winter months. The spray foam insulation also has the added advantage with the closed cell creating a good level of air tightness which is a particular problem with the older stock of poultry houses resulting with corresponding higher heating bills. These are the two main advantages with the spray foam insulation when used on older poultry houses. To achieve a continuity of the insulation layer it will be necessary for the ground floor of the poultry sheds to also be insulated. The thermal properties and cost associated as a result of specifying 100mm insulation in the floor of the sheds is €20 per m2. While in general the floor accounts for only 10%-20% of the total heat lost in a building, providing some insulation in the floor in this instance not only allows for a continuous insulation layer, improving the buildings overall thermal performance. 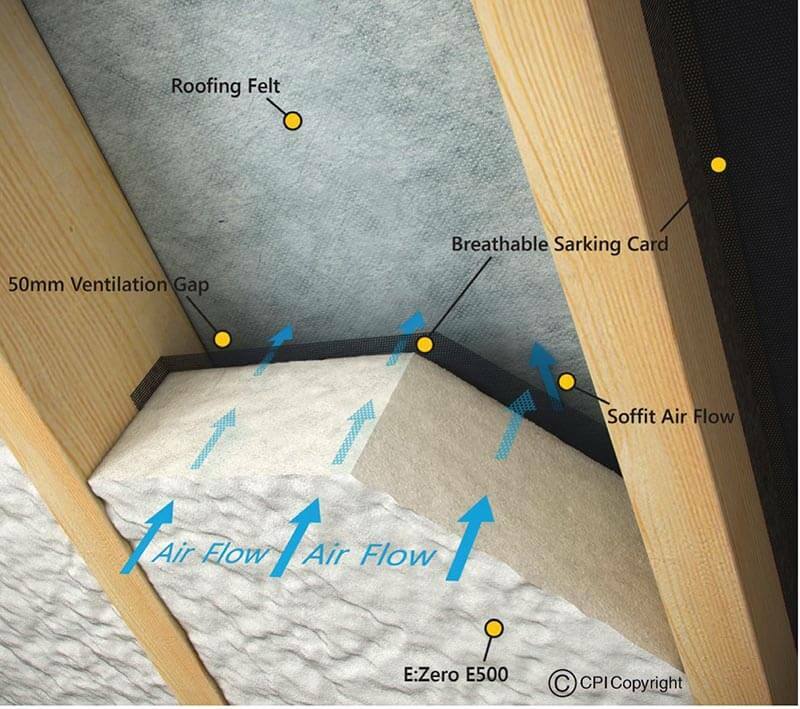 It is noted that this is expensive by comparison to the other improvement options, and it will also cause more disruption, however it ideally should be done at the same time as the walls and roof as providing some degree of insulation within the floor is an important factor in achieving the continuous thermal envelope. In future applications this could be recommended to the poultry house producer. 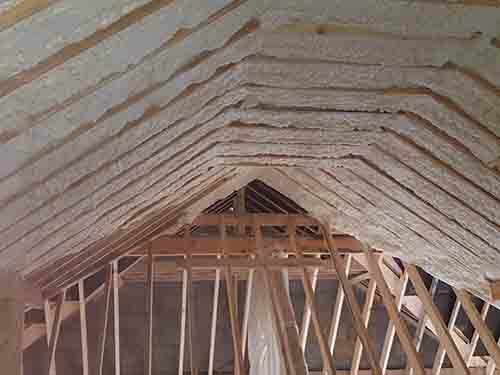 Spray foam insulation is relatively new alternative to traditional building insulation such as fiberglass in Ireland. Polyurethane, the most common type of spray foam insulation, was developed and used by the military in the 1940s and applied to airplanes. It wasn't until the 1970s that it started to be used as foam insulation. Various systems are used to apply the spray foam. The two component high pressure system is generally used in new home construction. It is a quick expanding type of spray foam. The two component low pressure spray foam is another system that is used primarily for retrofitting projects where there are existing walls with drywall already in place. This is also known as a slow rise formula and often referred to as injection foam. 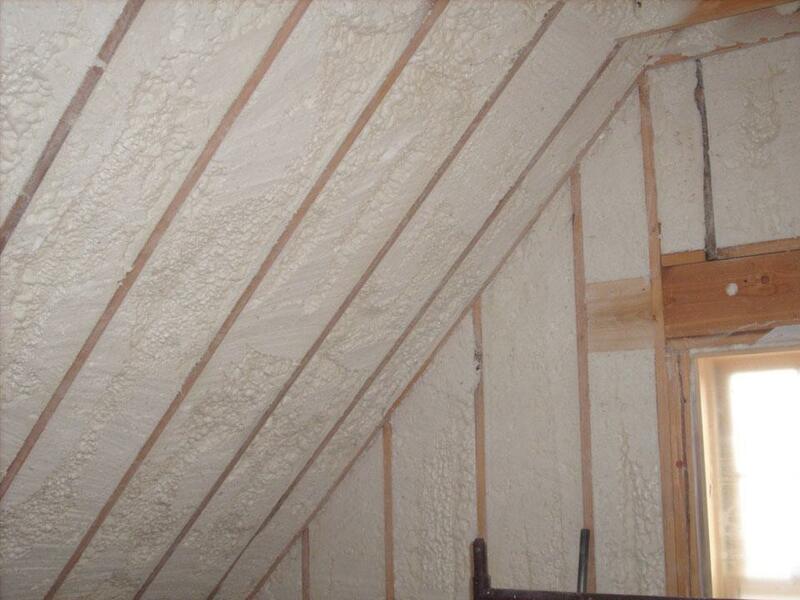 Spray foam insulation can be categorized into two different types: open cell and closed cell. Open cell is a type of foam where the tiny cells are not completely closed. Open cell is less expensive because it uses fewer chemicals. It is a very good air barrier but does not provide any type of water vapour barrier. It is much more sponge-like in appearance. It is often used for interior walls because it provides sound reduction by damping the movement of existing insulation. It is not recommended for outdoor applications. E:zeros E:500 Open Cell "breathable" insulation foam is spray-applied on the job site. As it is sprayed, it increases in volume up to 100-120 times, providing a fully adhered and airtight insulation layer, preventing frozen pipes in winter and keeping your home warm and cosy. Because it is sprayed, the foam fits all shapes, corners, and cavities perfectly. 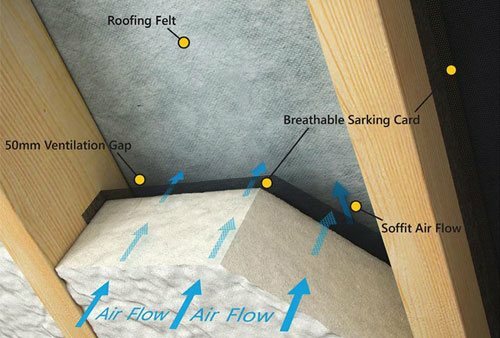 Our system is totally breathable due to the use of our own fully breathable Vent Card as seen in the diagram. This card allows us to create an air gap as per Building Regulations. Insulation and perfect air seal in a single application. Seven times better air seal compared with traditional insulation. Elimination of unplanned air-borne moisture movement and related condensation. Energy savings of about 50% compared with conventional insulation. E: 500 soft spray insulation foam can be applied anywhere fiberglass was traditionally installed. 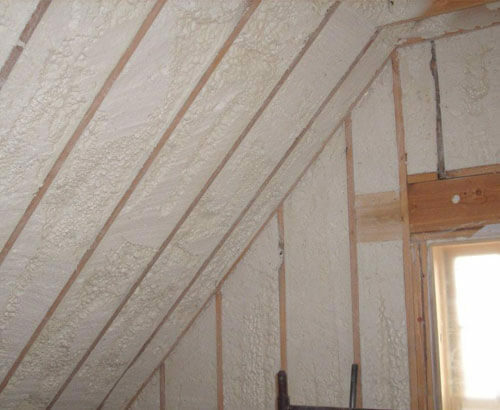 By replacing fiberglass, home owners get to enjoy improved energy efficiency and greater comfort of spray foam, while avoiding the shortfalls of fiberglass, from its carcinogenic nature to mould susceptibility. Please refer to NSAI Agrément Cert for further information before installation. 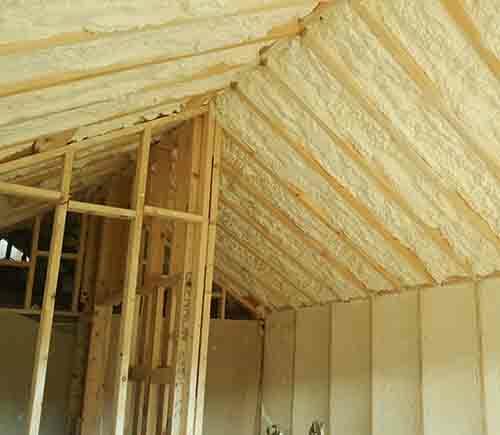 Closed cell foam insulation is a much more dense type of foam than open cell. It has a smaller, more compact cell structure. It is a very good air barrier as well as a water vapour barrier. 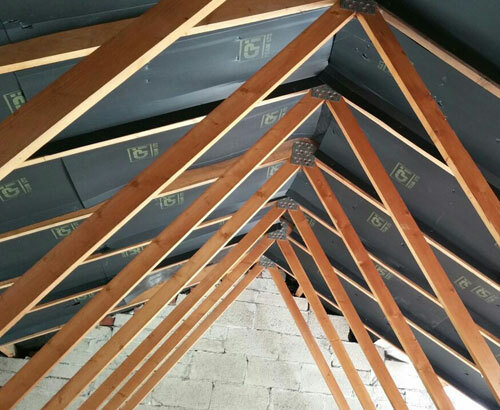 It is often used in roofing projects or other outdoor applications, but can be used anywhere in the home. E: zeros E: 2000 Closed Cell spray foam is spray-applied on the job site. As it is sprayed, it increases in volume up 50 times, providing a fully adhered, continuous, solid, and airtight insulation layer. Even the most minuscule cracks are perfectly sealed. Insulation and excellent air seal in a single application. Great for commercial buildings, garages, sheds etc. Same foam density as your copper cylinder. E:zero represents a new way of life that addresses one of the biggest challenges of our time: zero carbon emissions. E: zero's mission is to offer money-saving products that provide the 21st century comfort, while helping to save the planet. E: zero Foam contributes to the first step in the right direction: a 50%reduction of your carbon footprint. Elimination of unplanned moisture movement and condensation. The U-Value is a measurement which describes the heat loss in a building element; a low U-Value indicates a high level of insulation and therefore better thermal performance. U-values are measured in Watts per metre squared, per degree Kelvin (W/m²K). For the purposes of within this research project it is hoped that lower U-values can be achieved by revising the current specification for the Poultry Sheds. The following Table 1: Overview of U-Value and Cost Resultsis intended to display the results of all the calculations ‘at a glance’. In the context of the overall thermal performance of any building, the U-values for the individual building components are only a part of the issue. Figure 5: Section Diagram of Potential Thermal Bridges highlights the typical major junctions of the building components in the Poultry Shed. Again the spray foam insulation will combat this issue by providing a continuous, unbroken thermal envelope. One key part of the poultry meat production cycle is the end of batch clean. This is when following the transportation of the flock to be processed. The build-up of chicken litter and bedding is removed and then the entire unit is cleaned out usually by power hose. A possible dis-advantage in the spray foam installation could have been the issue of damage and deterioration during this work; however this has not proved to have been issue a year since the application. A key aspect to this success is not applying the insulation below the concrete plinth level and due diligence while power hosing. In terms of the use of Spray Foam Insulation within this particular building application, environmental factors such as internal moisture levels and the ammonia levels associated with poultry farming may become an issue. This will require further analysis to ascertain the suitability and lifespan of the insulation within this application. 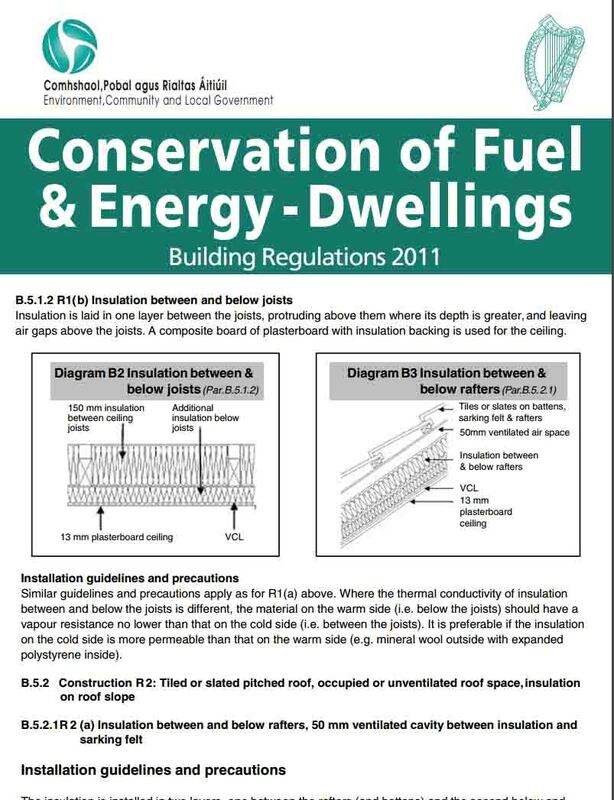 The main aim of this report is evaluate the costs before and after the application of the Insulation on Mr David Scott’s farm in Newbliss County Monaghan and provide accurate comparisons both in fuel usage and the corresponding costs. David Scott’s farm in Newbliss, county Monaghan produces over 192,000 chickens a year. Housing around 32,000 chickens the farm operates on roughly a 40 day cycle 6 times a year. The chickens are delivered to the farm at a day old and are taken away for slaughter at between 33 and 42 days old. Following the closure of Co-operative Poultry Products in late 2012 they switched to supply western brand. On Site there are two houses on the farm, both where built around 40 years ago and have current capacity of 32,000 birds and uses forced ventilation. Each house contains one direct-fired LPG heaters placed at the end of each unit. The temperature is maintained at between 20°C and 34°C depending on the stage of the cycle. 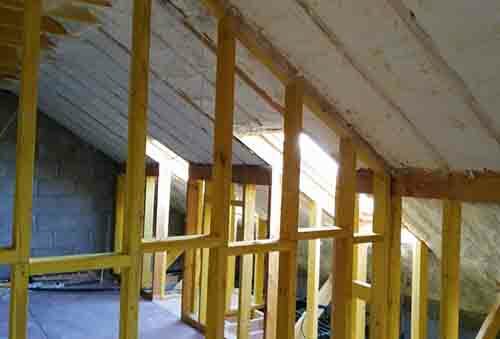 The installation was carried out by CPI FOAM LTD Insulation which comprised of approx. 2000m2 of wall area was coated with 50mm deep of E: Zero 2000 closed cell insulation in between growing cycles during December 2012 in order to minimise disruption. In order to understand the fuel usage and cost savings, I met with David Scott at his farm twice while preparing this report to carry out a simple assessment of energy use while also undertaking a walkthrough survey of buildings and facilities. 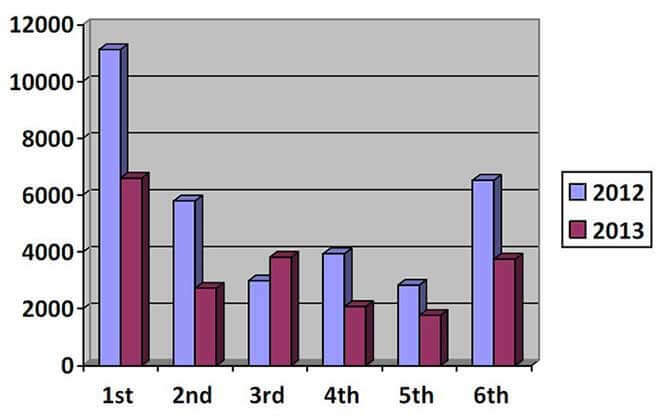 The graph below is the result of evaluating this fuel records from late 2011 to the present. 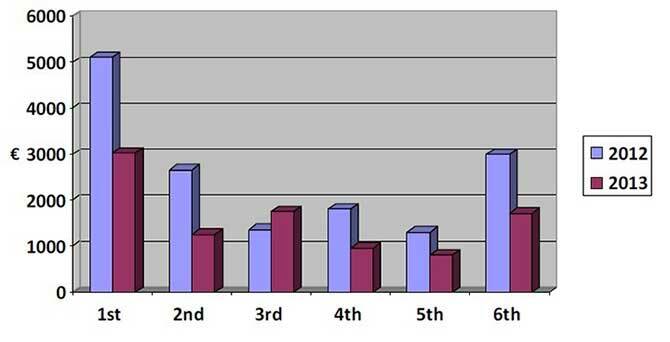 In the above graph, we can see the gas usage in litres for each of the 6 growing cycles in both 2012 and 2013. The first growing cycle took place in January 2012 which was during a particularly cold winter period this is reflected on the graph. We can also clearly see that usage has fallen in 2013 since the application of the E:Zero spray foam insulation from a total of 33,000 litres in 2012 to approx. 21,000 litres in 2013. As mentioned in section 3 the yardstick of associated Co2 emissions in food production in becoming increasingly important to the market. The corresponding savings over the 6 production cycles in 2013, was approx. 35,000kgs of carbon emissions. In the below graph the focus is on the economics of the gas usage. This will demonstrate the cost savings from the spray foam insulation. In the table below gives a quick comparison between both years in the total heating costs and also the average heating cost per growing cycle. The LPG costs for the 12-month period between January 2012 and December 2012 were €15,283 and the LPG costs for the following year with the improvements were €9,550. With energy costs continuing to rise, this was the best measure to contain the energy costs. 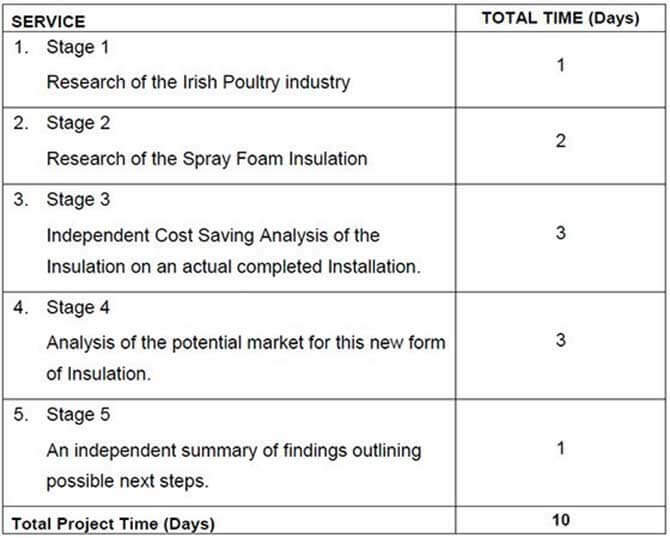 This report has outlined the properties of the thermal performance along with an independent cost saving analysis of an application to a typical Irish poultry house a year since it was installed. This research project has shown that the additional insulation to the roof and walls has improved the rate of heat loss in the buildings. Reducing energy use makes good business sense; it saves money, provides a competitive advantage, enhances farm reputation and plays a part in reducing carbon emissions and thus reducing greenhouse gas emissions. Mr David Scott has already been rewarded with significant corresponding savings. It is also clear that the application will work best in with the older Irish poultry housing stock due to high levels of air leakage and poor thermal performance. The effect would not be as significant with the more modern poultry house construction. It is recommended that while insulating the floor may also be expensive, it is also important in the overall thermal performance of the building and is required to form a continuous thermal envelope. This is a key factor that should be pointed out in future before commencement of works. In terms of the use of spray foam insulation within the poultry sector, environmental factors or concerns such as internal moisture levels and the ammonia levels associated with poultry farming may become an issue. This would require further analysis to ascertain the suitability and lifespan of the foam within this application. Finally this report has also identified and has quantified the number of Irish poultry farms. This figure represents a significant market for the potential use of this insulation in situations such as the poultry farm in Newbliss. These poultry producers will be keener on retrofitting existing buildings versus the planning regulations and large capital cost of new construction. A future step would be to seek approval or endorsement of the product from the poultry industry.